Children love books about the traditional villains like wolves and lions. I suspect they like the tiny thrill of fear about the bad guy, and also the wisdom of identifying his ulterior motives. I have a little brother so I just loved the way Big Sister grabbed her sibling’s hand and took control of the lion’s seeming agenda. Children will love to join in the great dialogue parts, especially “No! No! No! NO!” In fact, A Lion is a Lion would make a fine text to begin a discussion with kids about being able to say “NO!” to things and situations that make them feel uncomfortable. It’s a fun book to read aloud or share with others. I also see it making a great choice for a discussion with older kids - after all, is a lion still a lion even if she or he changes appearance and mannerisms? What other characters do we know who have done this? This is a perfect picture book to bring to life with kids as a performance! The actual text is short enough to be memorised so it could readily become a choral piece. I can also see it as reader’s theatre with additions - the lion singing “Hoobie-doobie-doo” could be developed into a short song for a chorus behind one child as a lion, and two kids as big sister and brother. The wonderful think about children is that they will have so many creative ideas about how to use A Lion is a Lion as a springboard for something else. 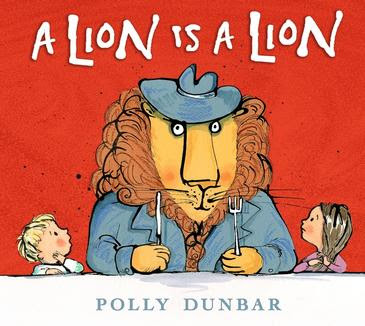 A Lion is a Lion has inspired me to create a new list: Perfect Picture Books for Performance which you’ll find embedded below. I’ll be adding to it over time, so do let me know if you have recommendations for this list.